The C3BI offers practical trainings on specific bioinformatics and biostatistics topics throughout the year. Do you want to attend a training? More than twenty years after the first bacterial genome has been sequenced, microbiologists are faced with an avalanche of genomic data. However, the quality of the functional annotations of the sequenced proteome is very poor with more than half of the sequenced proteins remaining of unknown function. 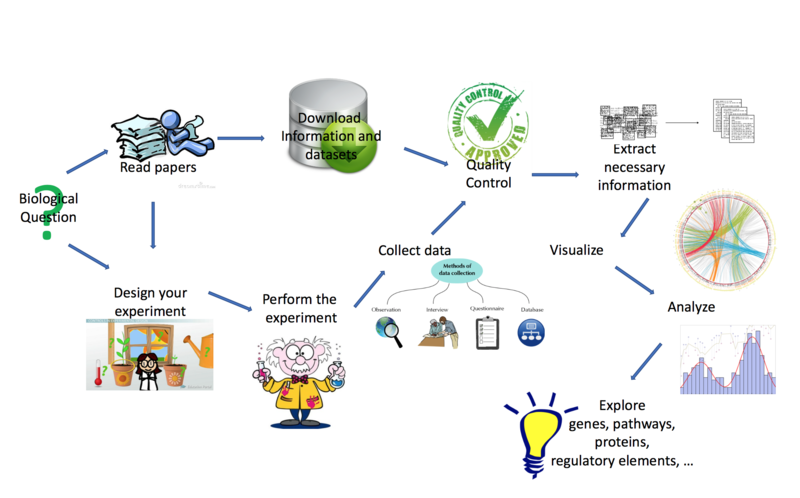 With nearly 80,000 whole genomes sequences available and increasing amount of post-genomics experimental data available, it is possible to gather different types of information that lead to better functional annotations and can guide the experimental process. The workshop will guide the attendees through practical examples and show them an array of tools and databases that they can apply directly to their research problem. No prior programming experience is required, all the tools available can be used through graphic user interfaces. The University of Los Andes and the Hub of Bioinformatics and Biostatistics of the C3BI (Center of Bioinformatics Biostatistics and Integrative Biology) at Institut Pasteur will organize this Hands-on course aimed at students/researchers that have produced HTS data sets and would like to learn how to get the most out of it. This course will provide a general introduction to the bioinformatic and statistical aspects of HTS data analysis, alternating theory and practice. The objective is to present the general concepts such as file formats, mapping of sequences, as well as, the specific procedures for each data type: DNA-Seq, RNA-Seq, ChIP-Seq. An additional session will be devoted to the pathway and functional analysis for gene set issued from differential or other kind of analysis. Knowledge of the basic Linux and R commands is highly recommended. Otherwise it is advisable to follow the introductory tutorial available on the course web page. Please be aware that the workshop will be delivered both in Spanish and English. Starting Tue 24 Oct 2017 – Linking gene and function, comparative genomics tools for biologists. More than twenty years after the first bacterial genome has been sequenced, microbiologists are faced with an avalanche of genomic data. However the quality of the functional annotations of the sequenced proteome is very poor with more than half of the sequenced proteins remaining of unknown function. After taking this course, students should master an array of web-based tools to help to predict gene function. This will allow them to generate in silico based functional predictions and produce illustration for manuscripts that use comparative genomic methods. session 2 from 11 AM to 1 PM. Course location : Lectures will take place in Amphi Jacques Monod. Please note On Fridays, lectures will take place in the Bâtiment François Jacob, room 28-01-01A. On February 10th and 17th they will take place in the afternoon, from 1:30 to 3:30 for session 1 and from 3:30 to 5:30 for session 2. The main objective of this training course is to provide the trainees: i) a concise theoretical framework of the state-of-the-art methodologies and analytical approaches to analyse metagenomic high-throughput data and ii) help and assist the trainees during intensive hands-on sessions to apply these methodologies on their own real datasets and answer their own scientific questions. Furthermore, the course will be an opportunity for the trainees to meet international experts in the area, generating a highly motivating and synergistic environment for incorporating new knowledge, setting up collaborations, answering questions and asking new ones. Understanding physical and functional interactions between molecules in living systems is crucial in many biological processes. Several powerful methods and techniques have been developed to generate molecular interaction data, focusing mainly on protein­protein interactions (PPIs). In particular, PPIs involving partially or completely unstructured regions are building blocks of regulatory and signalling networks that control cell response to external and internal cues. Exploring these interactions may help understanding a protein’s function and behavior, predicting biological processes that a protein of unknown function is involved in, and characterising protein complexes that can be used to modulate or perturb known biological processes and pathways. Overview. In this course we introduce web-based tools to analyse and interpret high-throughput biological data. In the main focus will be g:Profiler – a toolset for finding most significant functional groups for a given gene or protein list; MEM – a query engine allowing to mine hundreds of public gene expression datasets to find most co-expressed genes based on a query gene; and ClustVis – a web tool for visualizing clustering of multivariate data using Principal Component Analysis plot and heatmap. Audience. Biologists and bioinformaticians who are dealing with high-throughput gene expression data or other high-throughput data and would like to learn state-of-the-art methods for mining and analysing such data. Learning objectives. g:Profiler – learn how to perform gene set enrichments analysis and find what are the most significant functional groups in your gene or protein list (for example interesting genes/proteins from Q-RT-PCR or RNA-seq experiment results). To learn how to convert gene and protein IDs from one namespace into another or find corresponding gene/protein IDs from another organism. MEM – learn to perform and interpret MEM co-expression queries. Given a query gene, MEM performs co-expression analysis across hundreds of public datasets and returns ordered list of globally similar genes. We’ll learn how MEM can be used to infer potential function for a gene based on other genes that are globally similar. For a gene pair we’ll learn how to identify the datasets and conditions where they behave similarly and where they do not. ClustVis – learn how to make exploratory data analysis plots using ClustVis web tool. How to prepare a dataset for uploading the data or search among publicly available datasets. We learn how to filter a chosen dataset using ClustVis and how to choose pre-processing options. We will learn how PCA plot and heatmap can be modified and how to interpret and export the results. Prerequisites. Common understanding of high-throughput technologies does help to follow the lectures. Access to web browser is required. This theoretical and practical course is aimed at researchers that would like to get the most out of their Next Generation Sequencing datasets. We will tackle several topics, encompassing theoretical NGS approaches and statistical analysis of NGS data. The first week of this course (Oct 3rd – 7th) will be devoted to theory and practical examples for a broad audience (100 participants), while the second week (Oct 10th – 14th) will be dedicated to practical analysis for a selected group (30) of participants. Prospective students for the hands-on section should apply and will be selected on the basis of their data and the analyses they wish to perform. The exact syllabus will depend on the interest of the attendees; we want this course to be of immediate value. The course will be held in Mbour in the AIMS Senegal facilities. The official language for the theoretical and hands-on session will be English. This hands-on NGS course is open to the whole Institut Pasteur International Network, Senegalese Universities (CEA-MITIC), H3ABioNet and AIMS Senegal. French Institute of Bioinformatics, France Génomique and Institut Pasteur . Metagenomics, the sequencing of DNA directly from a sample without first culturing and isolating the organisms, has become the principal tool of “meta-omic” analysis. It can be used to explore the diversity, function, and ecology of microbial communities. The aim of these 4 days workshop will be to give researchers and students an overview of the tools and bioinformatics techniques available for the analysis of next generation sequence data from microbial communities. Its content will focus on the taxonomic assignment and the functional analysis of metatranscriptomic and metagenomic data. The format will comprise a mixture of lectures and hands-on practical tutorials where students will process example data sets in real-time. The Hub of Bioinformatics, Biostatistics and Integrative Biology at the Institut Pasteur organizes thematic courses open to everybody. The second session, entitled “Introduction to NGS data analysis” will take place every Tuesday, from the May 17th to June 28th 2016, in the room Retrovirus No. 14, at the ground floor of Lwoff building. This course will provide a general introduction to the concepts of sequencing data analysis, alternating theory and practice on various data types: DNA-Seq, RNA-Seq, Chip-Seq, Metagenomics and HiC. The course is aimed at people who want to get familiarized with the concepts and tools used for the analysis of sequencing data. The objective is to present the basic concepts such as file formats, mapping of sequences as well as the specific procedures for each data type. Participants are asked to come with a fully charged laptop (not enough plugs available) with the required tools already installed (ssh connection client). The list of required software will be available on the course web page ten days before the start of the session. This course is an introduction to sequencing data analysis. Knowledge of the basic Linux command lines is highly recommended. Otherwise it is advisable to follow the introductory tutorial available here (https://cours.web.pasteur.fr/unix/unix-I/#1) and on the course web page. Le Hub de Bioinformatique et Biostatistiques de l’Institut Pasteur organise des cours thématiques ouverts à tous. La première session intitulée « Analyse exploratoire des données avec R » aura lieu du 7 mars au 18 avril, tous les lundi matin de 9h à 12h en salle rétrovirus, Bâtiment Lwoff. Les cours sont donnés en français. L’inscription est gratuite mais obligatoire pour les non pasteuriens. The primary aim of this course was to provide a basic understanding of the Leishmania genome, NGS technology and analysis tools, and to develop a basic pipeline for the students to start working on their data. This first pipeline will help to standardize all analysis done in the consortium and should facilitate a posterior paper publication. This pipeline will evolve in the context of a collaboration between the Leishield partners and the C3BI, taking into account the difficulties to analyze and interpret the sequence data generated, and the specific needs of each Consortium node. A future Workshop will be organized in June 2016 to tackle all these questions, and to have a follow-up on the analysis. The secondary aim of this course was to have a first contact between the C3BI and Leishield in order to establish a future collaboration. This course provided to the teachers and students, fertile ground to work together and exchange ideas. The objective is to provide to each student the knowledge and tools necessary to understand and analyze Next Generation Sequencing (NGS) data, as well as Genome-wide association studies (GWAS), no matter the dataset they have or where they come from in the RIIP. The course is around two weeks long. First week is devoted to theory sessions that will include the basis of NGS technologies, quality analysis, algorithms for mapping and assembling, different kinds of biological experiments and a strong focus on the corresponding statistical techniques. We will also offer and introduction to GWAS, Genotypic variation and linkage disequilibrium, and SNP array design, with some model cases. The second week is dedicated to practice, in which the students work with their own data in small groups with a mentor that guides them. The practice week is designed so the course is of immediate use to each student. We expect the students to go back to their countries with the necessary knowledge to continue working on their own data. Lastly, this course will also promote interactions through bioinformatics between different Institut Pasteur in the RIIP. We will only accept candidates coming from Institut Pasteur International Network , Fiocruz, and the University of Sao Paulo (USP). Candidates must fill and send the application form, a short CV (2 pages max) and a letter of support from your head of laboratory or mentor to the following email: inda_training@pasteur.fr Deadline for the application is July 31st, 2015 at midnight (Paris time).